The Bank of Ireland Leinster Rugby Camps will be on in July and August in 22 venues across the province and are for boys and girls aged 6-12 years old. 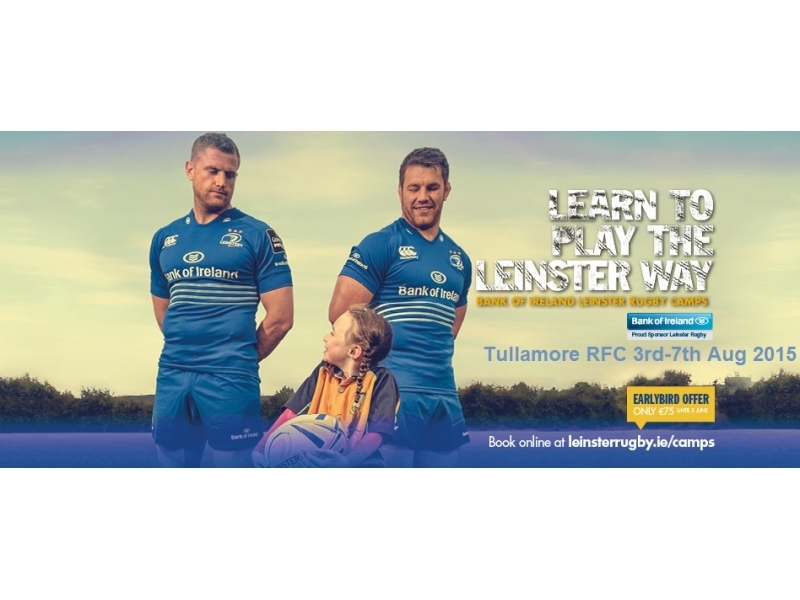 As last year’s camps sold out, we would urge that you encourage your members avail of our Early Bird Offer of €75 (ending 5pm 5th of June) directly at Leinster Rugby or for more information visit www.leinsterrugby.ie/camps. Special Offer: Anyone who books a camp place before the 20th of March will be entered into a draw to win a family ticket to the Leinster Rugby V Bath European Rugby Challenge Cup Quarter Final on the 4th of April, KO 3.15pm in the Aviva. Note: winner will be chosen at random and contacted via email. You can book a second camp for your child for just €60 (no kit included). I have attached the brochure which can be printed to book via post. · A Canterbury of New Zealand pack including a training t-shirt, a ball, and a draw string bag. · Learn new skills; make new friend and most importantly-HAVE FUN!